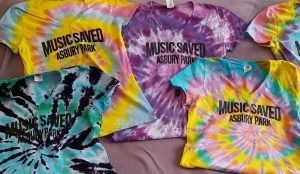 Place orders by emailing your request to (info@asburyparkmusiclives.org). We will send you the order form and give you details for payment and pickup options. See styles and pricing below. All orders must be placed via email first. Note that sizes my be limited so please wait for a confirmation e-mail before making payment. Following email confirmation, your order can be picked up at Lakehouse Music between 4 and 6pm. Only confirmed orders will be available for pickup. You will receive instructions following confirmation of your order. Did you e-mail order form? Remember, the proceeds from these t-shirt sales make it possible to support our Music Saved My Life youth programs! 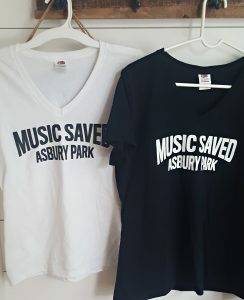 Dubbed the must have t-shirt of this past summer,(see the fantastic article here ) our MUSIC SAVED ASBURY PARK t-shirts are being spotted all over the world! 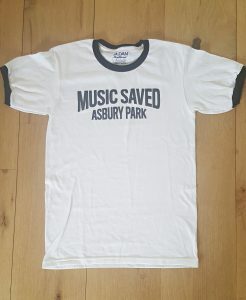 We have had local Asbury Park notables like Southside Johnny,Glen Burtnick, Bobby Bandiera, Danny Clinch, Eddie Manion and visiting celebrities like New York Yankee Bernie Williams sport the shirt. Look at some of the notables from our gallery!